Truth be told, I'm rather exhausted. I've done so much travelling lately, and there's more to come in January as I go on a mini-book tour. The proposed changes to our house were finally approved by Service Départemental de l'Architecture et du Patrimoine and other powers that decide how a village with roots in the Roman and Medieval periods should look, so we now have to start the process of deciding on fixtures and finishes and anxiously going through our finances to see how much work we can actually get done. Given all of that, we've decided not to do a whole lot for Christmas this year. We won't have a big Christmas dinner or anything, just a low-key celebration at home. Part of our low-key Christmas will be this simple yet delicious, buttery pound cake. I didn't have time to make a Christmas pudding weeks in advance (though I made one for my mom to enjoy back in Yokohama, back in mid-November.) It's really easy to put together, and the brandy or Calvados soaked raisins add just enough holiday cheer. It's also a cake that tastes better after a day or so, so I can get it done in advance and not worry about dessert. Pound cake is called quatre-quarts, which means 'four quarters', in France, because it has 4 ingredients in 4 equal amounts. It's popular in Brittany, home of delicious butter and salt. (Did I meantion that we almost decided to settle down in Brittany last year? The butter and salt had a lot to do with that.) 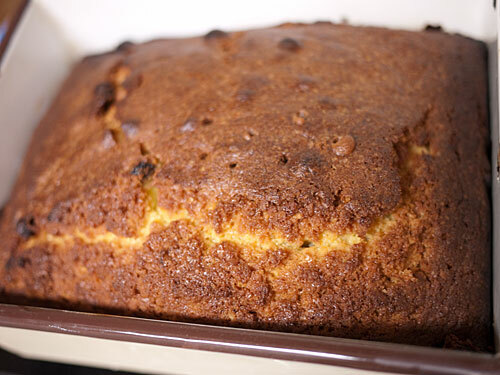 This pound cake has quite a lot of added salt, which makes the flavor of the butter really come to life. Note that I used unsalted butter and add salt, rather than using pre-salted butter. This gives me the control over how much salt goes in. I've used enough so that you can taste the salt, as you can in all Brittany pastries, but not so much that it's overwhelming. Using Calvados to soak the raisins keeps it northern French in feel, but any good brandy will do, or even rum if that's what you have on hand. This can be baked in a square (such as an 8 x 8 brownie pan), rectangular or round cake pan. It's not at all fussy in that respect. The 4 base ingredients in the cake should be equal in weight. For the best results, I highly recommend using a scale, although I have given cup amounts too. But before you weigh out the ingredients, please read through the instructions. The amount of raisins is not that critical - you can leave them out if you prefer a plain cake. Equipment needed: An oven, 3 bowls (one for the eggs, one for the flour and dry ingredients, and the largest one for mixing everything), a flour sifter (optional), a wooden spoon, a spatula, a whisk of mixer or food processor. At least a day before you plan to bake the cake, put the raisins in a glass or ceramic container and cover with brandy or Calvados. Cover and leave to soak for several hours. You can soak more raisins if you wish, and store them in the refrigerator for later use. 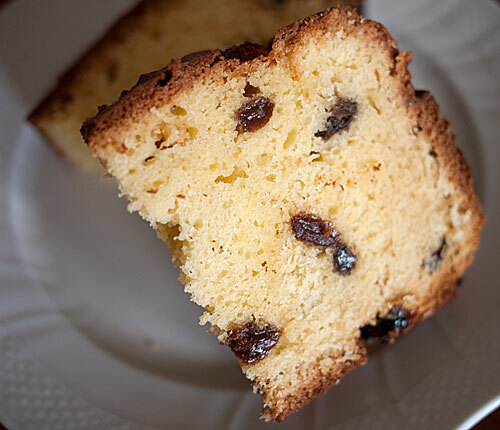 To bake the cake: drain off the liquor from the raisins. (Keep the liquor in a jar for flavoring other cakes and such.) If you're not using a non-stick pan, coat the inside of your pan with butter then lightly flour it, to prevent the cake from sticking. Break the eggs and weigh them. 5 'large' eggs should come out to about 250 grams, but whatever the weight is, that is how much in weight of the sugar, butter and flour you will need. So, once you've weighed the eggs, weigh out the same amount of butter, sugar and flour. Soften the butter - putting in the microwave for a minute does the trick. Pre-heat the oven to 180°c / 350°F around this point. In a large bowl, beat the butter and sugar together with a wooden spoon or a sturdy whisk until the mixture is white and fluffy. Add the flour mix a little at a time, incorporating it with a spatula. If you're using a mixer or food processor, make sure you don't over-mix after adding the flour or the cake will get a bit heavy. Add the raisins and mix them in with the spatula. Put the batter into the prepared pan, and put into the preheated oven. Bake for about an hour; start testing for doneness at around 50 minutes in, by poking the center with a skewer or chopstick or knife. If it comes out clean, the cake is done. If not leave in for a few more minutes and test again. Take out of the oven and let cool before taking it out of the pan. This is how my most recent one looked. The top has cracked, but no matter. The cake tastes great when fresh out of the oven, but is even better the next day. It continues tasting good for a few more days. You can serve it sliced, or cut into dainty cubes. For an adult dessert, put a slice or cubes on a plate, and spoon over a bit of the liquor you used to soak the raisins. Top with softly whipped cream that's been flavored with more of the liquor and a bit of sugar. Submitted by maki on 2010-12-21 19:24. Hi, this looks absolutely delicious! I was wondering if I could substitute dried cranberries for the raisins. Would I need to soak them in anything? Cranberries should work fine, and be nice and festive looking too. You may want to soak them in liquor as with the raisins. Hi, the cake sounds delicious. I am wondering if I could reduce the sugar. Thanks ! With cake recipes, changing the base ingredients will totally change the character of the finished item. You do so at your own risk. 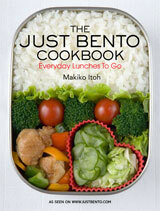 Hi there, this looks really yummy, I can't wait to try it! You might want to mention that softening the butter in the microwave for a minute really was just a figure of speech, that it's actually less than a minute, at least in my oven. ;-) Thanks for such a great site. Happy holidays! Brandy soaked raisins? Now that's my kind of pound cake. ;) Merry Christmas! I made this for Christmas and it was a huge hit! I made some homemade whipped cream and mixed in some of the leftover apple brandy. Everybody loved it. Thanks for the great recipe! I made the cake for Christmas and it was hit and miss. I made the cake with dried cranberries and golden raisins, soaked in Jack Daniels (what can I say, I'm American!). My aunt and a few of my friends who enjoy the luxury of alcohol really liked it, but since most of my family is non-drinking they didn't like the idea that I had used "booze" in the recipe. Also, the edges ended up getting much too brown by the time the middle was done. But I believe that was a mechanical error. So yummy! I made it two times already!! !